Last night’s hard frost left roads throughout the town more akin to ice rinks. Frosty weather is to be expected during winter months, but we also expect to see the gritting wagons out spreading salt to keep drivers safe. On the gritting page of the Travel Somerset website, Somerset County Council states that they only provide precautionary gritting for about 17% of all the roads in Somerset, and have recently warned that resources are particularly limited this year. The same page shows a map of the roads that are to be included, and there are currently several notable omissions within Wincanton. In fact, it seems the only roads guaranteed to be gritted are from the A303 to the one-way system, Station Road, Church Street, and South Street, and the road to Bruton from North Street. 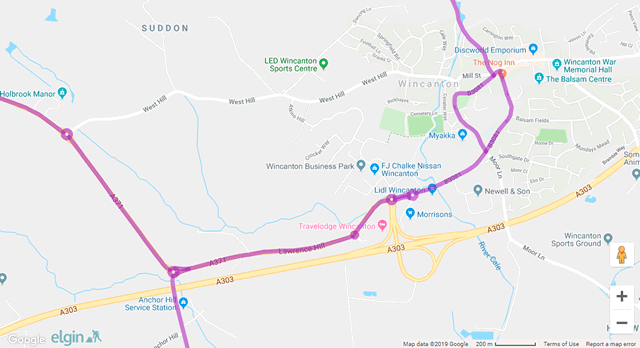 No other road in Wincanton appears to be included, though a County Council spokesperson has claimed that Wincanton High Street has now been added to a list that would allow gritting to take place, but only if resources are made available. To make matters worse, sometime yesterday evening the three-way traffic lights at the Carrington Way junction failed, freezing in the red position. Due to the works taking place there, even with the lights working, negotiating this town centre junction has proved frustrating to motorists over the past week. The morning didn’t bring any relief. With the rush hour building, the lights were still frozen on red, and if not for the quick thinking of a Town Council operative, stepping in to help safely direct the traffic, this junction would have been grid-locked. Another frost is forecast tonight, so don’t expect High Street or West Hill to be gritted and drive safely.